Rattlesnake Awareness April 27, 2008, originally uploaded by EcoSnake. 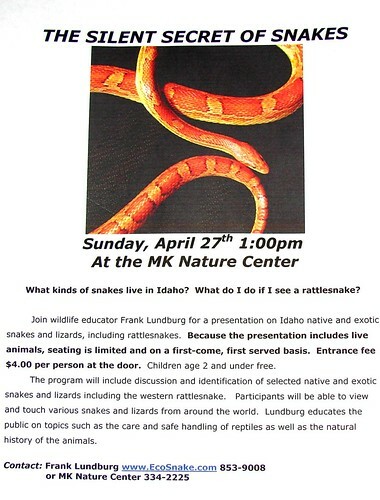 Frank and the EcoSnake team are presenting the Rattlesnake Awareness and Silent Secret of Snakes program this Sunday, April 27, 2008 at the Idaho Fish and Game MK Nature Center in Boise, Idaho. If you live in the area and want to learn more about these great animals, please try to come… The Nature Center is located in Boise at 600 South Walnut - corner of Park Blvd. and Walnut Streets. The program starts at 1:00 pm. Thanks!